The new mobile business model — with anytime, anywhere transactions and a blurring of lines between corporate and individual — can make your IT organization feel like it has lost control. For all the good that comes with mobilizing your workforce, there are challenges: maintaining security and compliance, managing multiple device platforms and addressing complex mobile requirements. You can’t throw a rock these days without hitting a new smartphone or tablet device. Last week, it was the iPhone 5 and the new Kindle Fire HD. Tomorrow, HTC’s expected to introduce some new mobile products. And Apple still has yet to introduce the Apple “mini” iPad, currently expected in October. The move to mobile computing raises some intriguing questions about the nature of work. What is it? Where does it take place? As someone who’s worked their entire career at IBM, I can certainly attest to the idea that here, increasingly, work is not a place you go but what you do. I’ve spent nearly nine full years working from my home, and several of those years, spent at least a week a month living (and working) in airplanes. As the IBM “Services for the Mobile Enterprise” team recently observed, the new workplace is now undeniably a mobile enterprise. Which makes it no big surprise that 66 percent of CIOs plan to increase investments in mobile services in the next year. And of course, there’s the “BYOD” movement to contend with (“Bring Your Own Device”), with employees expecting whatever device they have to fit into their corporate environment. This new mobile business model, with anytime, anywhere transactions and a blurring of lines between corporations and individuals, can send IT folks into a conniption fit. Despite all the goodness — for employees, management, and most importantly, the bottom line — there are challenges that accompany this mobilization of the workforce. Issues such as maintaining security and compliance. Managing multiple device platforms. Addressing complex mobile requirements. IBM recently released this interactive infographic that has some interesting statistics I thought worthwhile sharing here. To start, 35 percent of the world’s total workforce is expected to be mobile by 2013. Here in the U.S., up to 72.2 percent of workers are already plugged in remotely. This year, some 43 billion mobile applications are expected to be downloaded. And yet on average, mobile workers spend only a total of 28 minutes a day on technology distractions…there’s too much work to do, otherwise! And here’s the upside bonus for you managers: Such mobile workers work an average of 240 extra hours per year. But as the infographic observes, with those benefits come expectations. This new mobile generation of workers demands flexibility. Today’s employees expect to use their own devices and applications at work to access information and social networks at will. They even value this flexibility more than a higher-paying salary (Can you say “Mobile enables work/life balance?”). Cisco’s Connected World Technology Report in 2011 found that 66 percent of workers said they would take a job with less pay and more flexibility in device usage, access to social media, and mobility than a higher-paying job without such flexibility. So, as businesses work to embrace these new productive mobile work habits, they must also face the requisite challenges asscoated with the growing number of devices, networks, and applications. Enterprises need a solution that intertwines cross-platform compatibility, security, cost management, compliance, and the inevitable complexity. By way of example, 21 percent of mobile workers say they have experienced a security issue related to their smartphone (lost, stolen, hacked, virus) in the last year alone. Fifty-four percent of enterprises rate security and authentication as one of the two top concerns for their mobile environments. Seventeen percent say they need to meet compliance/regulatory requirements in mobile environments. And yet 45 percent of IT departments say they aren’t prepared policy- and technology-wise to handle this more borderless, mobile workforce. To overcome those challenges, enterprises need an experienced partner with a strategy capable of spanning the distance between mobile advances and existing infrastructures. Those early adopters are leaping ahead: They’re already experiencing 20 percent cost savings and productivity improvements. 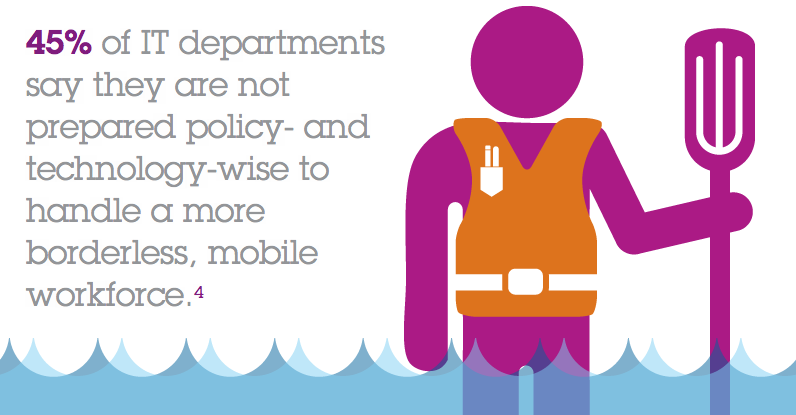 And 75 percent of CIOs say mobility solutions are a top priority of theirs for 2012. On the mobile front, IBM workers are walking their own mobile talk, connecting to 10 different networks located around the world, and with 100K+ of them connecting using their own handheld devices (using at least five supported device platforms). All of that experience IBM has had with its own mobile enablement has informed and shaped the company’s customer-facing mobile initiatives, both through product development and through the introduction of its mobile services offerings. IBM can help your staff develop the right strategy and governance and deliver a wide range of mobile enterprise services to create a more productive, connected workplace. You can read about some of those offerings here.